Putts Gained is a statistic that show how many strokes we're gained from putts compared against the PGA Tour benchmark based on distance of putt to the hole. Negative numbers represent strokes lost and indicate better performance. The PGA Benchmark for putts at a distance of 8 feet is 1.5 strokes. If a player finds themselves on the green 8 feet from the hole and it takes two putts to hole out, then that player has a 0.5 for their Putts Gained. 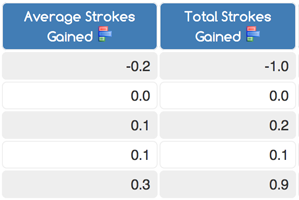 If they sink the ball in just one putt, they would have -0.5 Putts Gained.